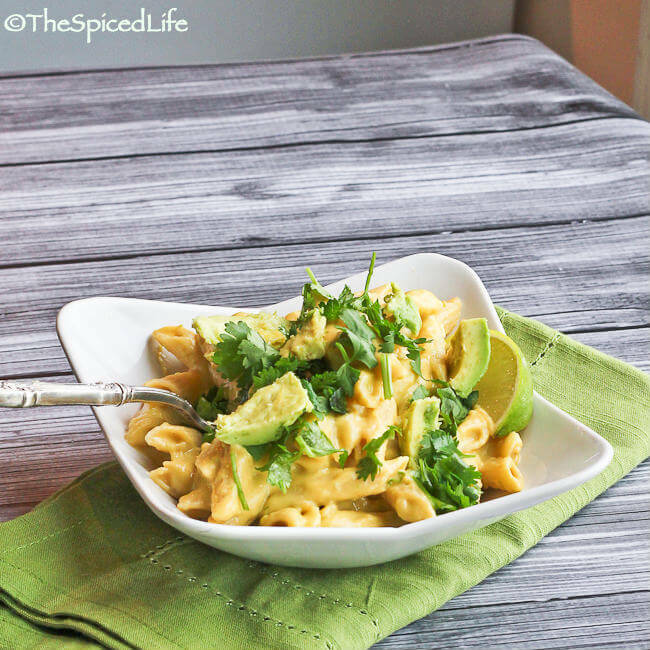 Penne Pasta with Cheddar Cheese, Avocado and Lime is a fantastic and flavorful twist on Macaroni and Cheese, and because it is made on the cook top, it is also fast and easy! Affiliate links have been used to link to items I am discussing. One of the awesome things about Melt is that it includes pasta salads with cheese served cold or room temperature, stovetop macaroni and cheese and of course oven baked macaroni and cheese casseroles (there are also desserts!). So basically this is a year round treasure trove if you like cheese. And we like cheese. A lot. So when my parents came to visit the other day and I needed something to round out the kale salad and tilapia, I turned to the stovetop section, figuring it was chilly enough for that but not of course the kind of cold that leads to relishing turning on the oven (and yes since then it has been sweltering hot–but it has to end soon, right!?!?!). 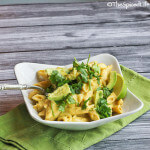 Ironically–because food blogs have been filled with avocado based macaroni and cheeses for a while now–I was never tempted to try avocado in my mac until I saw Stephanie Stiavetti’s and Garrett McCord’s recipe. Creamy with avocado–that’s a given–but also tangy with green onion, garlic, cilantro and lime–it is those last four that convinced me. And I was right to be convinced. My parents both loved this and so did John and I. The kids liked it as long as I didn’t call it macaroni and cheese; yes even my children have been corrupted by the blue box. A note on the cheese: Stiavetti and McCord recommend specific cheddar cheeses for this pasta, but of course I could not find any of them at my local grocery store. I recommend visiting a good cheese counter and asking them for a recommendation for a good sharp cheddar that also melts nicely. Start the pasta water heating up. Be sure to add salt. Place the jalapeño, lime zest, juice of 1 lime, green onions and garlic into a food processor. Scoop out the flesh of 2 of the avocados and add them as well, and puree until smooth. Set aside. Cook the penne in the boiling salted water until al dente. Drain, rinse with cold water to prevent sticking and set aside. Now prepare the béchamel: Heat the milk in a small saucepan. Do not let it boil--as soon as tiny bubbles form at the edges, turn off the heat. Heat the butter in a medium sized, heavy saucepan over medium heat. 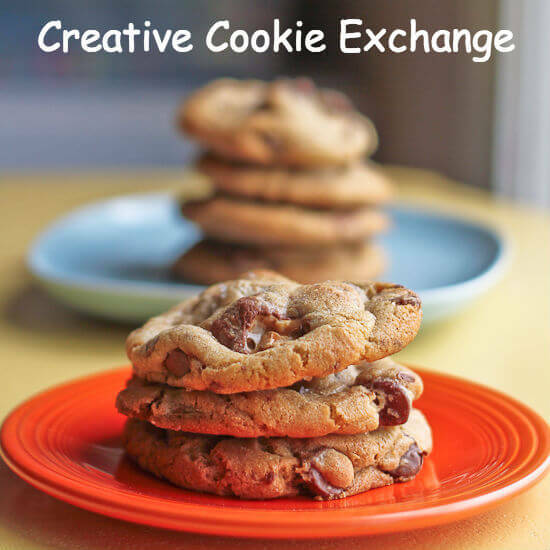 When it has melted, add the flour and whisk until it turns light brown. Slowly add the warm milk, whisking the entire time. When all the milk has been added, whisk to remove any lumps and keep stirring until the sauce thickens enough to coat a spoon (stirring should leave an imprint in the sauce). Switch to a wooden spoon or spatula. Remove from the heat and stir in the salt and pepper. Stir in the cheese until melted. Then stir in the avocado puree and chopped cilantro. Taste the sauce--add more salt, pepper or lime juice if necessary. Mix in the reserved pasta. Dice the remaining avocado and mix it in as well. Serve garnished with cilantro and lime wedges immediately. So glad you liked the recipe! 🙂 Your post made my day. The.Boy only likes mac and cheese from the box also, so I always have to call it something else when I make it for him from scratch. Weirdo. I’ve made avocado mac and cheese before, but nothing as tasty as all this! I’m glad you liked this cookbook. I like Matt McCord’s blog, but I didn’t like Melt, and you allude to the reason – very, very specific hard to find cheeses on every recipe. I didn’t want to risk making the substitutions but it sounds like you did and it was successful! 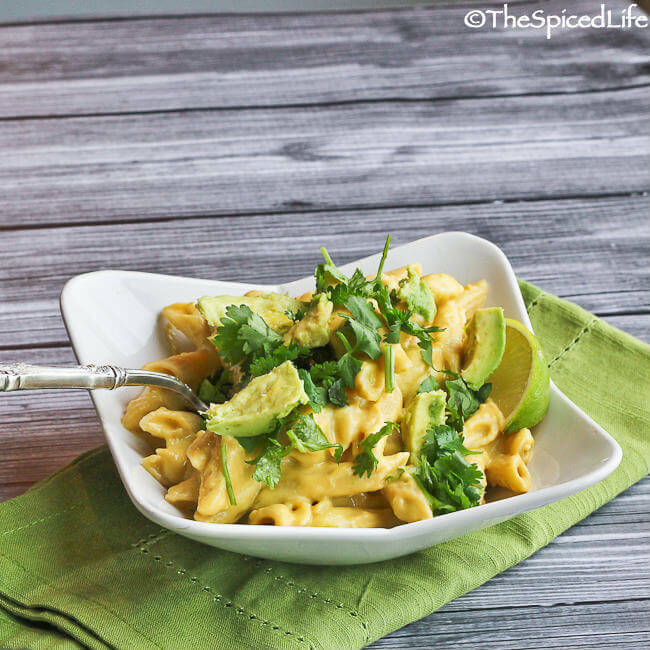 avocado is the perfect addition to mac and cheese but it never occurred to me! as heavenly as it looks. This mac and cheese is to die for! I love the addition of avocado!